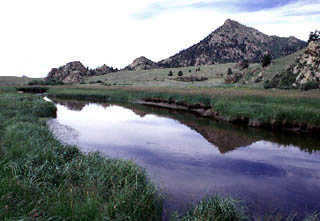 Description: An outstanding 4-mile section beginning just below the outlet of Tarryall Reservoir. The property offers rocky pocket water to a winding meadow stream. Throughout are browns and rainbows in the 10 to 14 inch size, and some even larger. A good dryfly stream with intense summer hatches and consistent clear flows. Location: The ranch is located along County Road 77, 18 miles southeast of Hwy. 285 at Jefferson and 22 miles northwest of the CR 77 juncture with Hwy. 24. Capacity: Limited to 3 anglers, or 2 groups of 2 each.